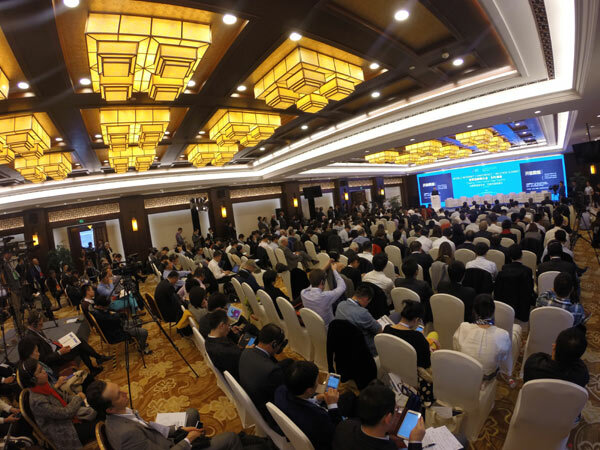 More than 1,000 participants from over 100 countries and regions are attending the World Internet Conference in Wuzhen, Zhejiang province, that opened on Wednesday, Nov 19, 2014. Experts from the industry and foreign officials attending the meeting are not only wearing interpreter devices in their ears but are also keeping notes so as to follow the speakers from leading global Internet players. Some sessions are so popular that latecomers are not able to get a seat. "The reason we are here for this particular conference is because the Internet is all about connection, for us connection is related to e-commerce, it's a big part of our growing in our business, so we clearly want to engage with the Internet," said Charles Thompson, General Manager of International & Partners Parcel Services Division of Star Track, an Australia-based logistics enterprise. "For us as a supply chain, particularly one that exports products from Australia to China, we need to understand the information flow that the Internet provides to manage the data," Thompson added. The other thing that is important to him is the social media. Supply chains like his will use social media to adjust their business development strategy. He will later join the Cross-border E-commerce and Economic Globalization session of the meeting and is keen to meet with Alibaba's Jack Ma. According to Thompson, Alibaba's logistic business in terms of establishing local careers and transportation firms in China is an asset-light strategy, coordinating tasks by using the assets and ensuring that the fulfillment is carried out functionally. "That's fascinating strategy," Thompson added. Speaking about the newly signed free trade agreement (FTA) between China and Australia, in which 85 percent of the products from Australia, including dairy, will enter the Chinese market tariff-free, the implication for the two nations' cooperation in trade area is profound, in terms of dairy industry, "under the new trade agreement, the dairy trade business will seen a similar success as it has seen between Sino-New Zealand," said Thompson. He said an increasing number of retailers in China have asked if his company plans to bring milk products to the nation. "In general, Chinese love organic and high quality products… and we see a significant opportunity in this area." For foreign firms who want a piece of the pie in China market, applying their business strategy in a targeted area "is all about adoption", said Thompson. "China has to think about what role it wants to play internationally. The EU, US, China, Russia, Brazil, and Germany, are the six players that will shake the Internet in the world and China is clearly one of them but it is not alone," said James Andrew Lewis, Director and Senior Fellow of the Technology and Public Policy Program of the Center for Strategic and International Studies in Washington, DC. Lewis will attend the upcoming Security and Cooperation in Cyberspace session of the conference on Thursday. "Meetings like this, if we can find a way for these countries to agree with, that would be great. (The countries) that come along and decide how does the agreement work; this is why the meeting can be very useful," Lewis added.